Avinash, T., Sandhya, T., Dodal, S., Chande, M., Pereira, T. (2016). Recurrent Ancient Intraosseous Neurilemmoma of Maxilla: A Rare Case Report. Iranian Journal of Pathology, 11(2), 176-180. Tamgadge Avinash; Tamgadge Sandhya; Shashibhushan Dodal; Mayura Chande; Treville Pereira. "Recurrent Ancient Intraosseous Neurilemmoma of Maxilla: A Rare Case Report". 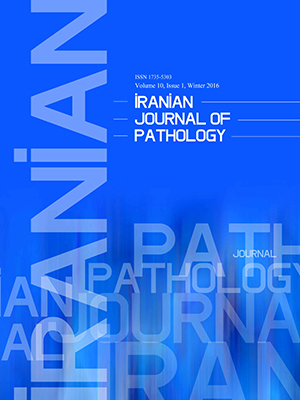 Iranian Journal of Pathology, 11, 2, 2016, 176-180. Avinash, T., Sandhya, T., Dodal, S., Chande, M., Pereira, T. (2016). 'Recurrent Ancient Intraosseous Neurilemmoma of Maxilla: A Rare Case Report', Iranian Journal of Pathology, 11(2), pp. 176-180. Avinash, T., Sandhya, T., Dodal, S., Chande, M., Pereira, T. Recurrent Ancient Intraosseous Neurilemmoma of Maxilla: A Rare Case Report. Iranian Journal of Pathology, 2016; 11(2): 176-180. Neurilemmomas are benign tumors of peripheral nerve sheath Schwann cells. One of the variants of neurilemmoma is the ancient type of neurilemmoma characterized by degenerative features such as cystic degeneration, calcification, hemorrhage and hyalinization which could be easily misdiagnosed. Their occurrence in oral cavity is extremely rare and intraosseous type occurring in maxilla is exceedingly rare with very few cases being published in literature. A 38 year old male patient reported with a chief complaint of swelling over the left cheek and left upper back region since 10 months. The case is of recurrent intraosseous ancient neurilemmoma in the maxilla in the patient which is distinctive for the lesion. This unique case presented with distinct histologic architectural pattern of ancient neurilemmoma showing degenerative changes such as cystic degeneration and recurred within a short duration of time. Martins MD, Anunciato de Jesus L, Fernandes KP, BussadoriSK,Taghloubi SA, Martins MA. Intra‑oral schwannoma: case report and literature review. Indian J Dent Res 2009;20(1):121‑5. Yang SW, Lin CY. Schwannoma of the upper lip: case report and literature review. Am J Otolaryngol 2003;24(5):351-4. Hatziotis JC, Asprides H. Neurilemmoma (schwannoma) of the oral cavity. Oral Surg 1967;24(4):510-26. Grabowski L. A rare case of schwannoma of the tongue. Otolaryngol Pol 2008;62(2):191-4. Marx RE, Stern D. Oral and maxillofacial pathology: A Rationale For Treatment. 1st ed. Carol Stream: Quintessence Publishing; 2008. BaranovićM, Macan D, BegovićEA, Luksic I, BrajdićD, ManojlovićS. Schwannoma with Secondary erosion of mandible: Case report with review of literature. Dentomaxillofac Radiol 2006;35(6):456-60. Chrysomali E, Papanicolaou SI, Dekker NP, Regezi JA. Benign Neural tumors of the oral cavity. Oral Surg Oral Med Oral Path Oral Radiol Endod 1997;84(4):381-90. Gallego L, Junquera L, Rodríguez-Recio C, Fresno MF. Intraosseousmandibular schwannoma mimicking an odontogenickeratocyst, with a postsurgical pathological fracture. J Laryngol Otol 2009;123(5):560-2. Weiss SW, Goldblum JR. Enzinger and Weiss's Soft Tissue Tumors. 5th ed. Philadelphia: Mosby; 2008. Ackermann LV, Taylor FH. Neurogenoustumors within the thorax. A clinicopathological evaluation of 48 cases. Cancer 1951; 4(4): 669-91. Chen CY, Wang WC, Chen CH, Chen YK, Lin LM. Ancient schwannoma of the floor of the mouth –A case report and review. Oral Oncol Extra 2006;42(8);281-5. Muruganandhan J, Srinivasa Prasad T, Selvakumar T, Nalin Kumar S Ancient neurilemmoma: A rare oral tumor J.Oral Maxillofac Pathol 2013;17(3):447-50. KimNR,ChungDH,ParkDS,Kim DW et al.Ancientschwannoma of oral cavity:a report of two cases. J Korean Assoc Oral MaxillofacSurg 2011;37(6):530-4. Gainza‑Cirauqui ML, Eguia‑Del Valle A, Martinez‑CondeR,Coca‑Meneses JC, Aguirre‑Urizar JM. Ancient schwannoma of the hard palate. An uncommon case report and review. J Clin Exp Dent 2013;5(1):62‑5. Chi AC, Carey J, Muller S. Intraosseousschwannoma of the mandible: a case report and review of the literature. Oral Surg Oral Med Oral Pathol Oral Radiol Endod 2003; 96(1): 54-65.